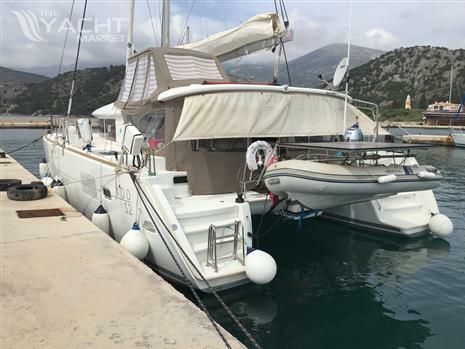 This 400 S2 OWNERS VERSION is fully equipped to go blue water cruising except for a water maker, (purchase in Gibraltar with low tax) for which, a through hull fitting is already in place. This boat was originally equipped to go on the ARC/ ARC+ and most of the incidental items required to live on a boat are on board and will be left by owner. This 400 is the much sought after 3 cabin owners version. With the Factory Option Added of interior wood in light oak alpi with a dark oak floor. Fitted carpet in Main Saloon and cabins, offering a very large main saloon with galley to starboard and large settee and dining table forward. Factory Option Added Upgrade to Special Leather Upholstery in Main Saloon to settees. Factory Option Added two additional leather stools in the main saloon. Enjoy panoramic views forward and easy access from the cockpit through sliding glass doors. Owners suite is to starboard and features a Queen berth aft with plenty of light and ventilation. In place of the standard sofa in the owners suite the Factory Option Added Storage Furniture aside the desk area and hanging locker along the outboard side of the hull. On the inboard side of the hull is more storage with Lagoon Dealer Option Added of Soba Baby Nova1150 Rapid Washing Machine. The large private head forward with Factory Option Added Quiet Flush Electric Toilet, black tank and separate shower stall, more storage both sides of the head. Fitted carpet to owner’s suite. On the port side aft is a Queen berth with hanging locker. The forward cabin consists of 2 single berths, convertible to a double and a hanging locker. Between the two cabins is a spacious head consisting of a shower stall, 2 x double door storage cabinets and Factory Option Added of a Quiet Flush Electric Toilet and black tank. There are the Factory Option Added of fans fitted in the main saloon and all cabins with opening hatches, an additional fan fitted close to the galley area. Fischer Panda UK Option Added 3 x Cruiseair 16k Reverse Cycle Air and Heat units, each with a Soft Start and a Fisher Panda 8000i (8kVA) 6.4kW Gen Set, control panel fitted near Nav Station for the generator. This 400S2 does include the ‘Comfort Package’ which includes many upgrades and was the largest add on package available on the Lagoon 400 S2 at the time of purchase. Enclosure fitted with sunblind on Port, Stern and Starboard, can be removed or left attached but rolled up, small modifications made to enclosure to minimise water ingress. Port helm on coachroof bulkhead includes: engine controls, engine instrument panel, electronics area, steering wheel with chafe guard and brake, double bench, access stairway from cockpit with S/S banister, pocket, footrest. Extra freshwater tank 300L / 79 US Gal.